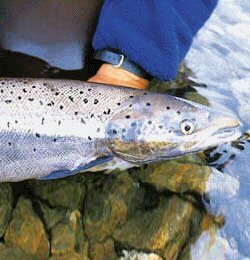 Atlantic salmon, or also known scientifically as Salmo salar, is a species of the Salmonidae family, residing in the northern Atlantic Ocean and in rivers that flow into the Atlantic. These salmon were the first of the family to be identified to Europeans. The species live all over the Atlantic Ocean portions of the Northern Hemisphere, from Connecticut in the United States to Labrador in Canada in the west, and all along western Europe from the north of Portugal to Norway in the east. This species has several subspecies, but unlike the Pacific salmon the individuals are so similar that they are all known by the common name Atlantic salmon, including the land locked varieties. Like the Pacific salmon species, Atlantic salmon are born in fresh water, mature in the ocean, and then return to breed in the places where they hatched. Unlike Pacific varieties, however, Atlantics do not die by design after the spawn. Many individuals will return to the ocean after laying or fertilizing eggs, but the trip is difficult both ways and thus the percentage to actually return is thought to be very low. When it comes to heading for the ocean, these salmon have various ages. For the most part, the age that the smolt head out for the ocean is directly related to the temperature of the water in which they were born; Atlantic salmon that hatch in England, for example, will head for the sea after about a year. 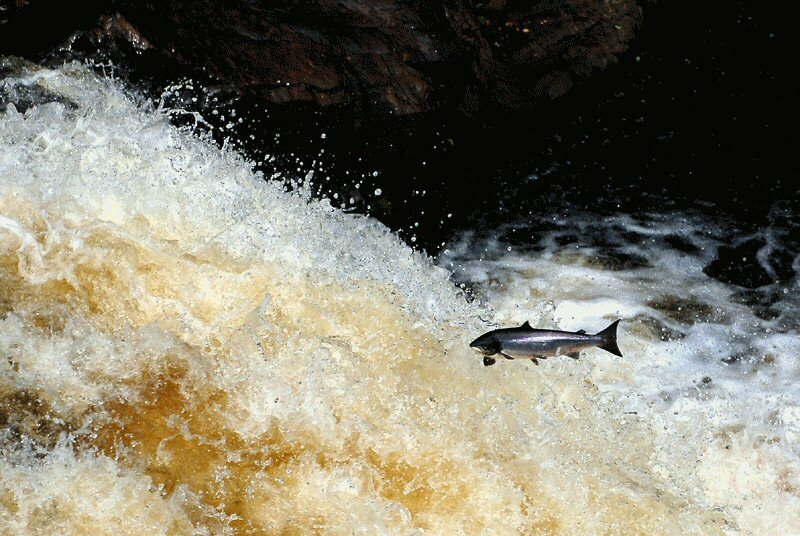 Scottish salmon, on the other hand, may not leave for salt water until they are around four years old. Once they reach the water, juvenile salmon will live in estuaries and bays until their bodies acclimate to the salty conditions. This does not take very long, and once the salmon head out to sea they will generally stay there for a further three to five years of their lives. Atlantic salmon have long been prized by anglers for their size and the fight they out up while on a fly in their fresh water phase. 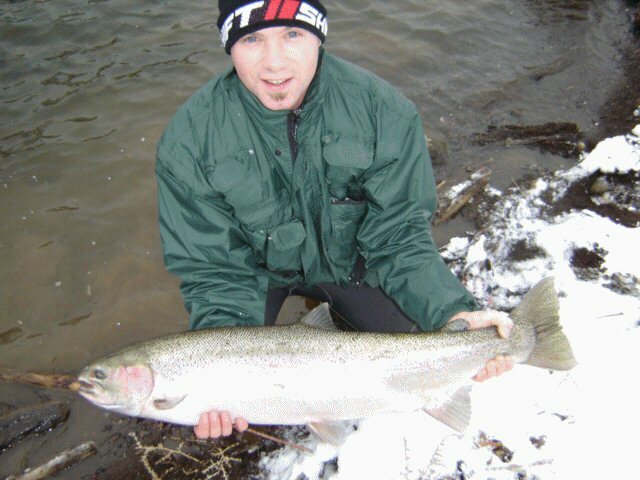 Heavy tackle is required, as these largest salmon species are almost five feet long in length and weigh around 100 pounds. Because of their importance in the European human food chain (including the countries that stemmed from European countries such as Greenland, Iceland, Canada, and the United States) this is one of the most fished species in the world. Its population in the United States has declined dramatically, and it is now protected in most rivers and streams where it breeds. In addition, pollution and environmental change are taking their tolls on the numbers. Several land-locked varieties of Atlantic salmon have been extirpated from their original habitat, including those in Lake Ontario. Atlantic fish, especially salmon, still play an important role commercially, making up over 80% of all farmed salmon species. Their introduction to the west coast has been particularly controversial, since they are prone to escape and carry diseases not encountered by Pacific varieties. Moreover, they are an aggressive and territorial species of fish and are though to attack native chinook and coho in territorial feuds. Atlantic salmon have accidentally migrated, in some rare cases, into Pacific water systems, so If you catch one by accident, return it safely to the water and report it to your local fisheries office. Also Canada has just recently contributed 30 million dollars to enhancing the Atlantic salmon population in the Atlantic ocean! An Atlantic displaying some amazing acrobatics during it's incredible journey to spawning grounds. Below is another diagram illustrating Atlantic markings. If you would like to learn more about each species such as Chinook Salmon, click on the hypertext or go to the top of the page to find out more about the species you're interested in.